There’s more to a dental implant procedure than just inserting some fake teeth in the mouth. In fact, this dental procedure is equivalent to minor surgery. If your dentist has recommended implants, then you may feel a little anxiety and fear; it’s normal to feel those things. However, it may help ease your mind if you learn more about what goes on before, during, and after this dental procedure. Essentially, dental implants aim to replace damaged or missing teeth and roots with artificial ones. Dental implants are also a more comfortable and permanent alternative to full-mouth dentures. Not everyone can undergo a dental implant procedure. There are specific physical and health requirements. If you have the following attributes, then you may be a good candidate for a dental implant. These are the factors that your dentist will look at to see if you are fit to get dental implants. Dental implant surgery is not a procedure where you go into the operating room with missing or damaged teeth and come out with new, artificial ones. It needs outpatient care and occurs in several stages and may take several months to be fully completed. If the reason you are getting dental implants is that of an injured or damaged tooth, then the first step your dentist will do is to remove it. Teeth extraction is its own procedure and follows a different process. If your jaw doesn’t have sufficient bone mass to support the dental implants, then a bone graft procedure may be required. An oral surgeon will remove bone from somewhere else in your body (usually from the hip or chin) and set into your jawbone. A bone graft will require the jawbone to heal. After your jawbone has recovered, then the dentist will put the metal dental implant in it, screwing it into the bone to make sure it doesn’t move. Osseointegration, which is the healing and recovery phase after the bone graft, could take several months. When you have fully recovered, the oral surgeon will place the abutment to the implant. Then, when the soft tissue is done healing after that, a mold of your jawbone and teeth is made. At a later time, the dentist will place the dental crown over the abutment. This whole dental implant procedure takes several months because of the mouth and jawbone needing the proper amount of time to heal. A regular dentist may not always perform dental implant surgeries, so you need to find a dental implant dentist for an initial consultation. During the consultation, the dentist will perform a complete dental exam and take X-ray and impressions of your teeth. Your dentist will then discuss his or her recommended treatment plan and schedule with you. He or she will go over the dental implant procedure steps and the timeline for each procedure, so you how much time to allot for the whole process. Your dentist will also tell you whether or not a bone graft is needed. During the initial consultation, the first stage of the surgery is usually set. It can take between four and 12 months before your jaw is ready for dental implants if you’ve had a bone graft. Time is essential to let your jawbone heal properly and get it prepared for the procedure. Once the jawbone has healed, it’s time for the implant. It’s the metal screw that sets into the jawbone and serves as the anchor for the artificial teeth. This step can take an hour or two, and you will be asleep during the whole procedure. After getting the implant into your jawbone, the healing process will usually last up to four months for the lower jaw and six for the upper part. When the implants have fused and linked with the jawbone, a healing collar (or healing cap) is next. It needs to be put on top of the implant to condition the gum tissue to heal correctly. The collar will need to stay for up to two weeks. 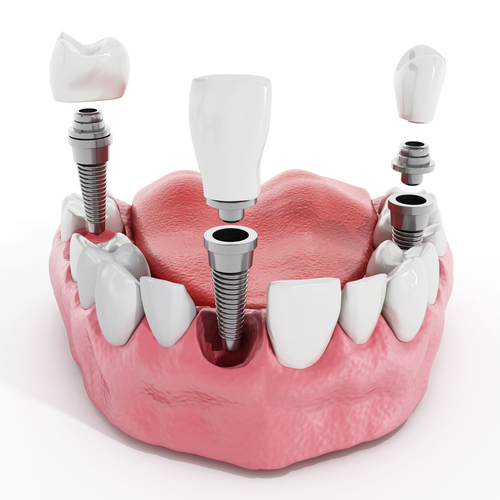 The abutment is the part that screws into the dental implant. It also gives support to the dental crown. Once it’s been placed, an impression will be taken for each tooth that needs to be replaced. You will then get a temporary crown to help the tissues heal. It may take up to six weeks for the tissues to completely heal. The final stage of the dental implant procedure is the placing of the permanent crown. It can either be cemented in place or screwed into the abutment. Cementing the crown in place looks more natural, so it’s the preferred choice by many.